Noted social worker and editor of Bodoland Sansri, a Bodo daily newspaper Jahar Brahma expired last night around 11.45 pm at a private nursing home in Guwahati. He was 68. Brahma was suffering from japanese encephalitis and was under going treatment at a private nursing home in Guwahati for the couple of weeks. 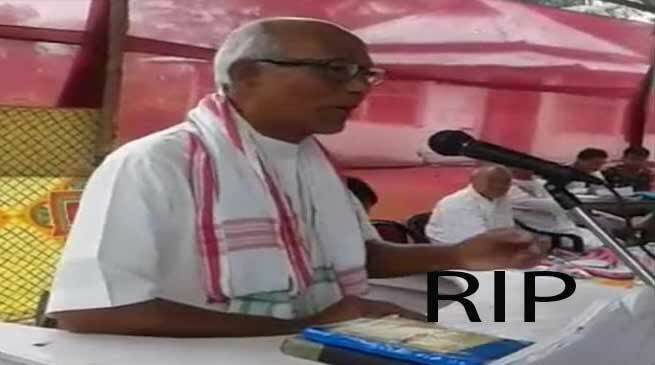 A retired school teacher, late Brahma was closely associated with Brahma dharma and also served as the editor of Bodoland Sansri, a Bodo daily newspaper published from Kokrajhar till his death. He leaves behind his wife, a son, two daughters and host of relatives and well wishers. His son Shivnath Brahma is state secretary of Assam state unit of BJP. He was cremated at his birth village Kamalsingh Kazigaon in Gossaigaon subdivision of Kokrajhar district.